I use a lot of chicken for our dinner recipes. My kids like chicken and it’s a great way to encourage them to try different types of food. 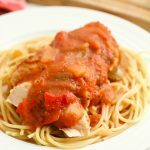 My daughter also loves pasta so it only made sense to try Crock Pot Chicken Cacciatore when I was pulling together more slow cooker recipes to make now that baseball has started again. You can serve it over pasta like I usually do or over rice. Spaghetti squash would be good too. You can even do CrockPot Chicken Cacciatore with potatoes! I like recipes that have some versatility and this one works well for that! 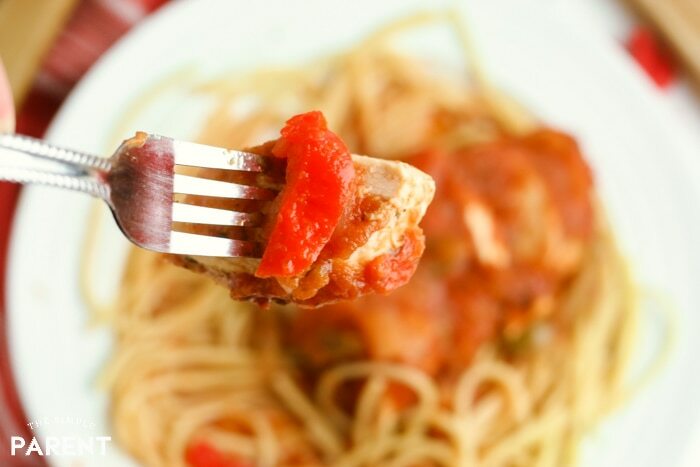 I make this easy chicken cacciatore with jar sauce because it’s quick and simple. I do like to add some extra seasonings to it for flavor, but they’re ones that I have in my kitchen most of the time so the ingredient list for this recipe is actually pretty small. So get your favorite sauce and toss everything in the slow cooker. For this recipe, I don’t cook our pasta in the slow cooker. I cook it on the stovetop and then serve it with the Italian chicken from the Crock Pot. You’ll have a great family dinner ready for you, no matter how busy your night is! 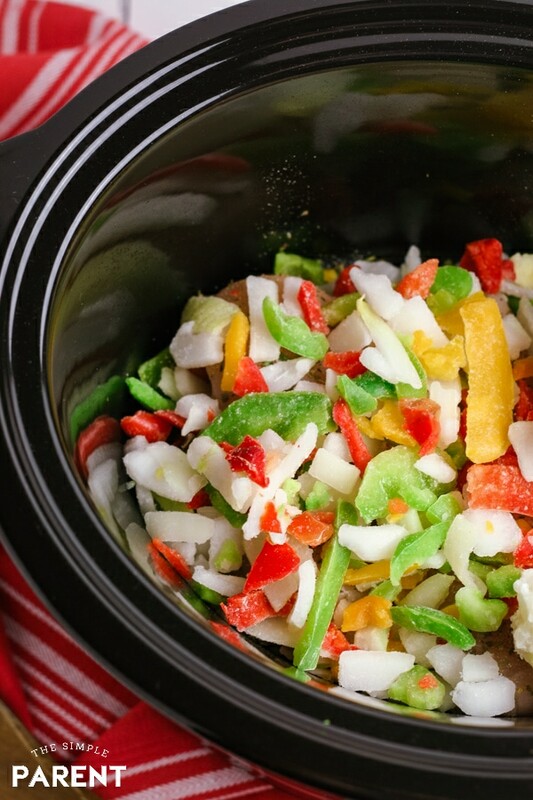 It’s easy to prep your slow cooker Italian chicken. 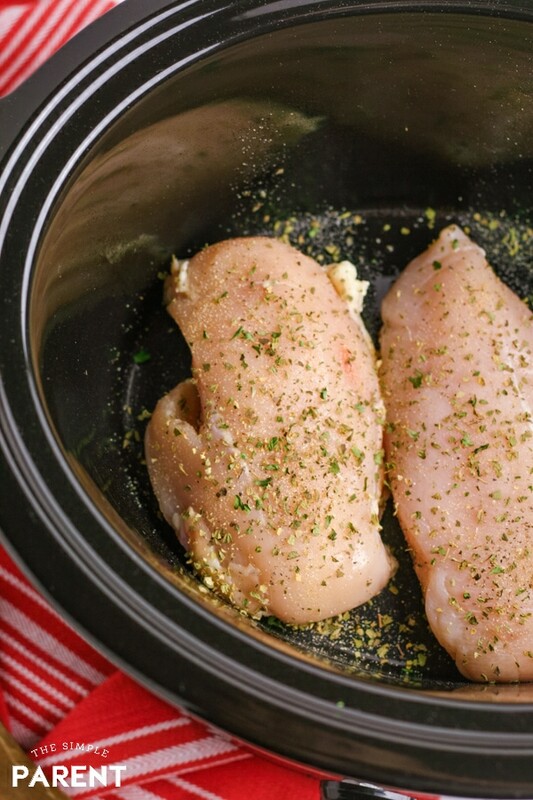 Place chicken breasts in the pot of the Crock Pot and season with parsley, oregano, garlic powder, and black pepper. Pour bag of peppers and onions over the top of the chicken. Add additional vegetables if desired. 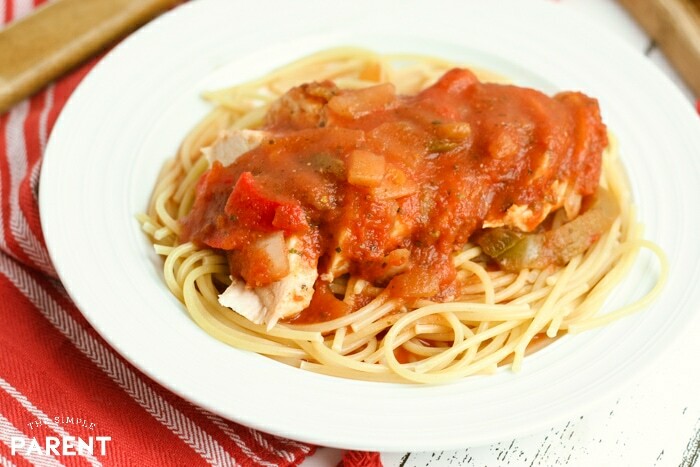 Add both jars of spaghetti sauce over the top of the chicken and pepper mixture. Cook on LOW for four hours or HIGH for two hours. If you like shredded chicken instead of full chicken breasts, take the chicken out of the Crockpot after cooking and shred using a fork. Then add the chicken back to the slow cooker and mix with the sauce before serving. If you prefer shredded chicken, remove the chicken breasts after cooking and shred using forks. Then put the chicken back into the slow cooker and mix with the sauce before serving. 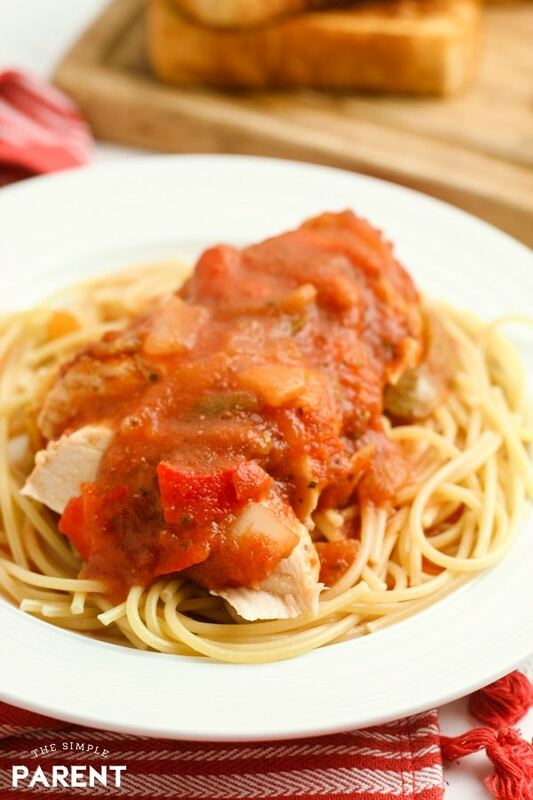 You can serve this easy chicken cacciatore over almost anything! Some of our favorites include pasta, rice, gnocchi, spaghetti squash, vegetable noodles, and potatoes! 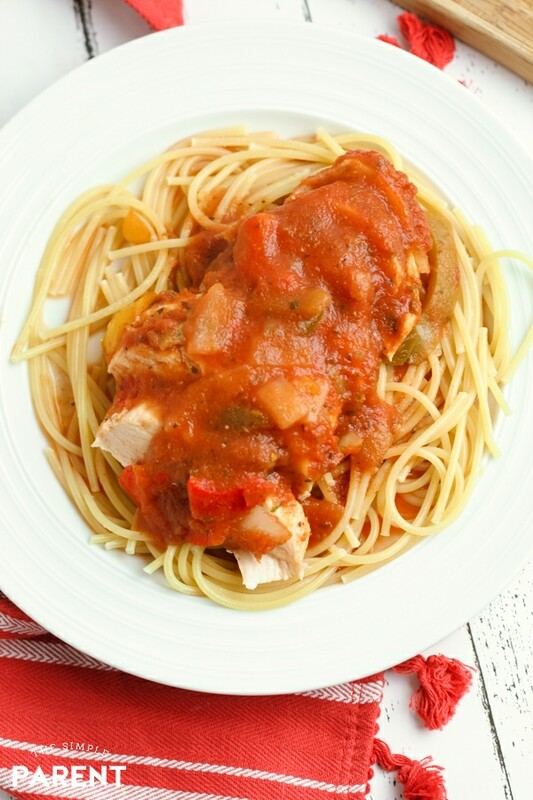 What are the ingredients of chicken cacciatore? The basic ingredients of chicken cacciatore include chicken, onion, garlic, mushrooms, bell pepper, olive oil, red wine (if desired), salt and pepper. For this recipe we did not use any wine as my kids prefer the flavor without it. The great thing about this recipe is that you can easily tweak the ingredients to fit your family’s favorite flavors. You can add more vegetables or choose the sauce you like best. What do you put in the chicken cacciatore? How do you cook chicken breast in the slow cooker? Can you use red wine in chicken cacciatore? You can use red wine in chicken cacciatore. It pairs well with the tomatoes. Some cacciatore recipes call for white wine and it works fine as well. You use about 1/4 cup of wine if you’d like to add it to this recipe. What do you serve chicken cacciatore with? 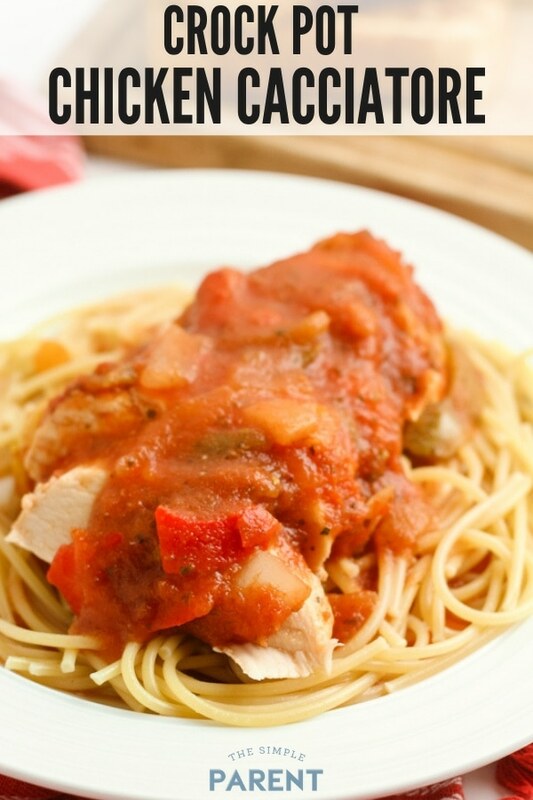 You can serve chicken cacciatore with a variety of pasta like egg noodles or fettucini. It can also be served with rice, gnocchi, riced cauliflower, zucchini noodles, or roasted potatoes! There are so many options! « Crockpot Cheesy Potatoes Family & Friends Will Love!